The 3rd Asia-Pacific Workshop on Marine Hydrodynamics. June 26-28, 2006, Shanghai, China. The self-guided marine measurement vehicle projects are oriented on design the new sea-robotics, which intended for observation on harbor, offshore and sea bays, including of the sail on heave swell condition, where presence of the seaman can be technically impossible or dangerous. This defines theoretical and experimental researches in the field of ship fluid mechanics, stormy seaworthiness and automatic navigation of the vehicles, necessary for reliable work of on-board measurement and telemetric equipment. Particularities of a flipper hydrobiology propulsion device, increasing possibilities and hiding of vehicle, including in heavy condition of the sail, are shown. The problem oft high velocity hydrophysical vehicles, which have a large floatability, and capable of active maneuver in the heavy swell conditions of sail, is shown. A traditional tumblehome ship hull, capable to long voyage on open sea, is considered optimal. KEY WORDS: Flipper fin; measurement; navigability; sea-robotics; seaworthiness; telemetric; vehicle. λ [m], τ [s], h [m], A [°] … length, period, height and direction of sea waves; L, B, H, D [m]… length, breadth, height and draught of marine vehicle hull. For sea surface researches can be an use small automated vehicle, capable to execute the observation on heave stormy condition of open sea, in hard navigational situation at shallow coast area of water, including with observance raised safety, ecological purity and secretivenesses of water surface voyaging. As a result of marine researches in 2001-2005 by "Search studies for unconventional decisions on optimization of the ship hull forms for sea quality performance"  is shown principle possibility of the conservation required nautical quality of the heave storm conditions. This can be used for small ship design (autonomous hydrophysic vehicle), then carrying on board a marine measuring equipment, which operated from remote coast or ship control centres. The possibility of the simultaneous using several selfpropelled modules, synchronous working in system of united time, greatly raises efficiency of the complex monitoring on wide sea area and coast area of water. The base of conducted shipbuilding researches was studies of the new mathematical models for determination of ship hull and sea waves dynamic interactions, with purpose of hull form optimization for best seaworthiness. Parallel the decides of engineering problem for placing of telemechanic units, navigational and hydrophysical measuring equipment; on production of the laws of the autocontrol by autonomous module; designing and test new flipper propulsions with cross-country capacity and maneuverability, including in hard navigation and stormy condition of the sail. an ecological examination to sea water surfaces, reception to information on dangerous sea phenomena or checking the condition of the emergency engineering buildings, execution other sea work, participation of the person in which impossible, dangerously or undesirable. Fig. 1. Drawing of the general location for self-guide remote control hydrophysical vehicle, optimized for sail in heave waves condition and intended for providing of complex hydrographical investigations on open sea and coastal waters. Foto a) … remote control telemetric vehicle on the open sea; Foto b) - a first test of small autonomous ship on still water surface. 1 - a deck superstructure for radio equipment and video control systems, 2 - an antenna of radio network bridge (11 Mb/c), 3 - an antenna to satellite communication "Gonec", 4 - an antenna of the navigational system "GPS-Glonass", 5 - a deck, covered solar battery, 6 - a fore compartment for hydrophysical measurement equipment, 7 - a middle compartment for the echo depth-sounder and ultrasound scanner, 8 - an screw propeller with movable control shroud on horizontal rudder stocks. 2) ultra small autonomous ship (Fig.1-b), capable to overcome the distances before 1000 nautical miles under onboard computer programme management. By itself solving of the problems on remote sea and coast water surface, such module can seasonly send the reports on its technical survivability and send current oceanography information on satellite links relationship. Displacement 65 kgs under useful instrument load 10 kgs, length of the hull 2,6 m, speed of the far move 3-4 knots, autonomy before 300 hours. Successful maneuvering of autonomous module on stormy sea can be not supported by traditional human experience on storm management ship. The well-timed decisions on course and speed of the move must be taken automatically directly on board autonomous module with use the special mathematical models, forecasting dynamics of the force interaction between the ship hull and fronts of the nearest stormy waves. Such are a mathematical models, as far as possible of their adaptation to real hull motion on heavy sea waves, will allow to optimize the condition of the robotic-vehicle under way, beforehand adjusting parameters of the autocontrol executive mechanism and her main engines, rudders and stabilizers of motion. On Fig. 2 is shown variant of modeling to stormy sea surface, when group structures of wind waves and swells the most active and follow by cell order with equally high amplitude. Valuing nature of the storm emotion on brought to illustrations, conclude that well-timed choice of the course and speed ahead of the ship motion possible greatly to reduce probability of the contradictory meeting with the most large decuman waves of the heave storm. For identification of stormy wave parameters for short-term forecast the most close to module of the large waves can be used on-board inclinometers and piezo-gyroscope, continuously analysing to dynamics of pitching and rolling and capable to optimize to beat up against the waves and minimize of yawing motion of course under way. Fig. 2. On airfoto (at the top) arrow noted two three-tuples the most large wind waves ("decuman wave"). Is it below are shown a wave field of mathematical model, presenting imposition of three cellular-group of trochoidal wave structures: by winds (λ=60, τ=6,2, h=7,2, A=250°); the first and second swell systems (λ=100, τ=8,0, h=5,9, A=210° è λ=160, τ=10,1, h=5,1, A=270°). Isolines of sea level are marked through 2 m. Course of ship motion in direction: A leads toward to wind waves, courses Á, Â and Ã - on 15° , 30° and 45° contrary to waves. Profiles of the waves are shown on the lower part of drawing on noted course À, Á Â and Ã. The mobile sea measuring equipment and facility of the sea robotics can become more efficient in the event of use noise-reduced flapping fin propulsors, possessing raised by reliability and possibility at sail in swelling zone and in powerfully polluted or algae overgrown area of water. The evident technical decisions is natural analogues sea hydrobionics representing for building such propulsors  - a different types flapping and flexible fin propulsive devices. In China, the other country of the Far East, in Africa is actively used real prototype considered here flapping propulsors. This known with antique timeses stern oar (Fig.3), unique capable to provide the safe sail, maintenance of the course and speed ahead of the motion on heave sea condition through large stormy waves with intensive rolling of rowing boat. Fig.3. 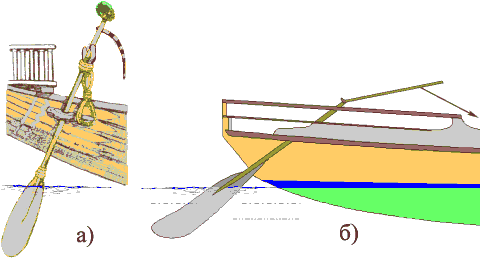 The typical cable brace of the fastening and handle curves of stern oars allow the almost automatically to adjust the angle of attack for plate of fin propulsor, providing alike force effort under fluent transverse flapping of scull oar without of dependencies from ship speed ahead conditions. Is it on the left a) - shown the vertical scull, which used in antique Egypt, on the right b) - a modern oar scull rowing boat of China, working which rower by one hand abuts against in tilted staff, but second … control of force effort, automatically adjusts angle of attack for flat of fin propulsor. Will consider for two modifications of flapping fin, suitable to use in composition of self-guided hydrophysical vehicles: the hard plate flapping propulsor (Fig. 4) and stern flapping fin with actively deformed by surface, working on principle of the wing of skate fish (Fig. 5-a) and caudal fin (Fig. 5-b). On Fig.4 is shown principle of the action already practised a flat (the sinusoidal) propulsor with hard wing, placed inwardly closed square-wave basket under stern counter of hull. The side walls of the basket serves as the end plate of wing for exception of the inductive curls on the end flapping wings, and his upper and lower plane serves the reduction vertical pulsation of ship hull when propulsor functioning, simultaneously creating specific "reactive" forces of pullings in extreme positions of the flat wing, where under the provisions of fluid dynamics optimization, a surface wings must was much powerfully curving. An one step of propulsor (also the angle of attack of the wing in his average position) is adjusted by radius and height of toggle lever mechanism, change which directly in propulsor operation much in a complicated way realize in practice. Other serious defect of such propulsor, its - impossibility to capsulation of self toggle lever mechanism, why he must work in subwater position, that also inadmissible for real ship, in view of quick corrode destroy of his rolling nodes. However for marine measurement complex, working at surfaces of water only limited time, such propulsor can be more reliable and efficient. The mathematical model of such flapping fin most simplest, and allows the calculations on two-dimensional (flat) spatial scheme. The evident defects toggle lever mechanism can be expelled in the event of use the linear pulse engines, operated by means of electronic watching systems. 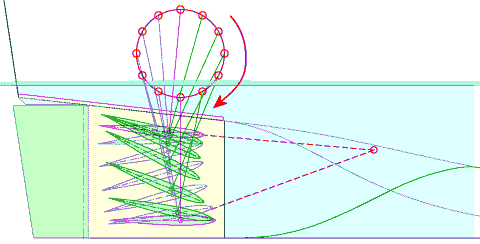 Nature flapping fin propulsor (Fig. 5) are notion as sequences of flexible wing plates, which has strongly manner of space motion by the ship onboard computers. Which flapping fin must taking into account need of the dynamic change the form so short wing for minimization of the inductive losses on his end of wing plate. Fig. 5-a. The exterior of flexible flapping fin propulsor like wing of the skate fish in straightened condition. Dotted line is shown nature of the twist on plate to surfaces of the fin under his simple slopping. Fig. 5-b. The sequence of flapping motions for symmetrical flexible fin propulsor. The maximum velocity transverse plate flexure of the fin accounts for his straightened condition at the average position with maximum angle of attack of wing, while in extreme slack point of the paths, edges of the fin reversing for use of stress on end of plate inductive curl. Astir leading rib of fin several overtakes springy bending plane of the flexible wing, that dynamically prevents the flow to liquids around his plate end, promoting givenned water curling near of fin as a whole. Flapping fin propulsor simultaneously serves as rudder and motion stabilizer on rough sea, that is reached by deflection and twist to centerline of the fin in process his flapping process. The fin does not lose capacity to work on silted or sand seabed, continuing be repulsed from it by serpentine motion. The mathematical model of flexible fin is complicated three-dimensional and unsteady flow always. Created now the nature model of flexible fin must become the instrument for check result of computational and towing experiments/ This model founded on three-dimensional tensor mathematics as specially computational model for a nonstationary fluidmechanics . The modern digital technology allows to form the executive mechanisms for governing complex motion of flapping fin propulsors, each of element which can move on strict mathematical law, including providing dynamically changeable geometry of flapping wings. The Executable nature experiments with stand and real variant of fin propulsor required in the first place for searching of the new mathematical models for automatic regulation of kinematical parameters of such fin motion processes. The optimum architectural decisions for making remote control hydrophysical vehicles follows to acknowledge designing well streamlined semisubmercible tumblehome hull of ship (Fig.1), capable to be in autonomous voyage on open sea for unlimited long time. Comparatively low speed of the move of such modules will wholly with requirements for continuously capacity to work onboard hydroacoustical and hydrophysical of the measuring equipment. The possibility of flapping fin using is one of the most important factor of the increasing to reliability and possibilities of small hydrophysical marine robotics. For complex study nautical characteristic new self-guided measuring complex are made experimental models in real scale (Fig. 1-a and 1.b). Test their are conducted on towing tank in Komsomolsk on Amur State Technical University, which equipment is adapted for undertaking basic researches for stormy seaworthiness of unconventional ship. The nature experiments in real sea condition of the heave sea sail is executed on Okhotsk sea, on Sakhalin and Kurily islands rough sea surface, which realize in expedition on hydrographical vessels of Sakhalin Branch of Russia Gydrographical services . This allow to research full complex of task about usages navigational, hydroacoustical, hydrophysical and the other measuring equipment, are perfected practical questions of the remote control by ultra small ships and receptions with it a marine telemetry information. The Studies are executed within the framework of basic plan of the Far Eastern Branch of Russian Academy of Sciences, at support Far East State Technical University, Komsomolsk on Amur State Technical University and Sakhalin Division of Hydrographycal Vessels. The author sincerely thankful for help and participation in performance the sailors and navy officers, teachers and professor, to render assistance and unselfish support new marine researches and their experimental approbation. Fine, A, and Khramushin, V (2004). The tensor notation of the computational fluidmechanics algorithms, Bulletin of The Far Eastern Branch, Russian Academy of Sciences, No 1, pp 52…68. Khramushin, V (2003). Prediscovery for storm seakeeping of ship, Vladivostok, Dalnauka, FEB RAS Publishing, pp 172 . Khramushin, V, Antonenko, S, and Komaritsyn, A, at al (2004). History of storm seakeeping from antique and our days (with multimedia application), Sakhalin Books Publishing, pp 282. Romanenko, E (2001). Fluiddynamics of fish and dolphin, KMK-press, Moscow, pp 411.